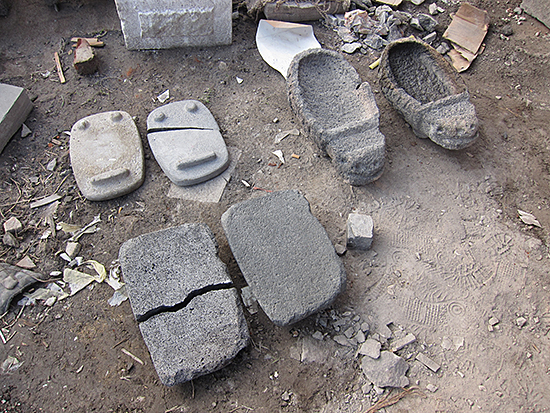 In 2012 two friends, artist Jorge Satorre and curator Catalina Lozano, went to the municipality of Valle de Chalco Solidaridad, Mexico State, a sprawling area south west of Mexico City DF where they both live. 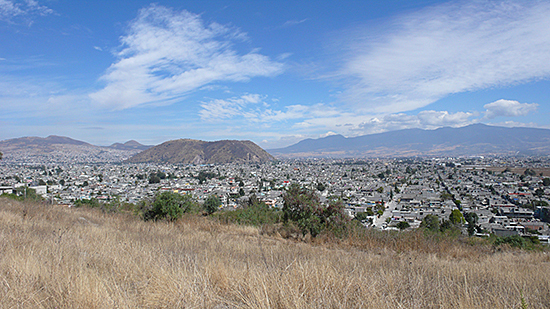 The area is known for its soil stratified with objects belonging to the cultures that populated the valley at different times. 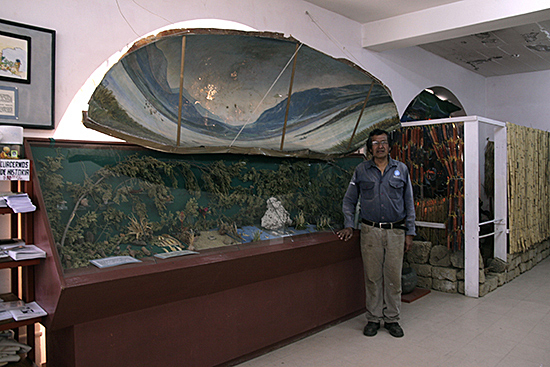 On their recurring visits Satorre and Lozano struck a friendship with Genaro Amaro Altamirano, the founder of the Community Museum of the Xico Valley (Museo Comunitario del Valle de Xico). Lozano had first come to the area on behalf of artist Maria Thereza Alves to investigate the artificial desiccation of the Chalco Lake at the beginning of the 20th century. The erasure of the lake altered the ecological equilibrium of the region and consequences are felt to this day. The settlers that arrived there to plough and to build the land for Inigo Noriega and those who came later, unearthed many remains of pottery and stone, and often kept and employed them in their daily lives. After some time, foreigners started taking an interest in those finds, selling one object could earn the locals almost a week salary’s worth. Things changed though when the government began cataloguing archeological remains as national patrimony. In 1996 Genaro Amaro Altamirano, who had emigrated to Xico from another area of Mexico, together with Onésimo Ventura Martínez, thought of gathering a community collection which consisted of objects donated by residents who had encountered them in spontaneous discoveries. Between 2012 and 2014, Lozano, Satorre, Genaro Amaro Altamirano, Mariana Huerta and Onésimo Ventura would meet and chat about many things, in particular the setting up of the museum, the challenges facing its legal status, its collective platform, and the layered histories of the pieces of the collection (the museum has over 5,000 Pre-Hispanic objects). 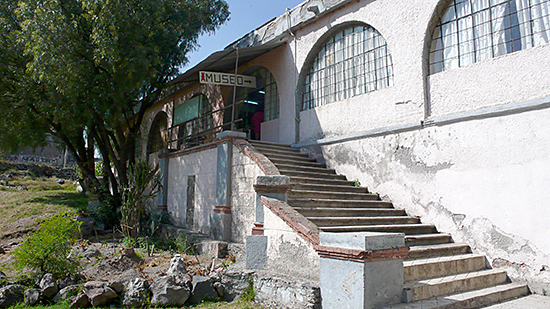 Lozano and Satorre learned that the museum is an autonomous organisation, maintained through the volunteer work of the local community and, although the collection is recognized and classified by the INAH (the Mexican National Institute of Anthropology and History), it does not receive any funding from the government. The pieces, which in most instances have lost their original placement, are problematic in the view of the fixed categories employed by the official archeology yet the museum collects information about the donors and the conditions under which the objects were found and how they arrived there. 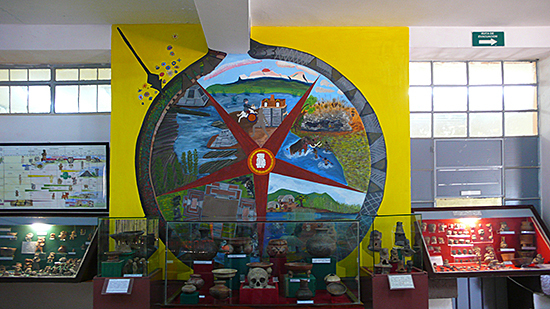 The people of the Museo Comunitario have devised a parallel classification system based on empirical archeological and historical criteria mapping a different material history, which welcomes personal and affective accounts. 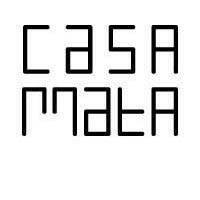 I am a European curator who has worked on art projects with Satorre and Lozano in London and Auckland. I am not familiar with Mexico and with the Xico area so I am dependent on the information gathered from conversations -both in oral and written form- with Lozano and Satorre and their accounts of the encounters and interactions with the Museo Comunitario. In 2013 from Mexico Satorre proposed to me a work for New Zealand that aimed at testing the topoi used by visitors to engage with an unknown place and employed an exchange of materials from the two countries to comment on a broader spectrum of cultural and social implications. 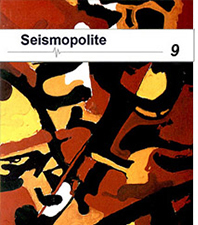 Inspired by Italian historiographer Carlo Ginzburg, Satorre has often used the idea of scale and that of circumstantial evidence (paradigm). In particular he metaphorically digs for micro-histories, which encapsulate the tension between master narratives and subaltern histories. 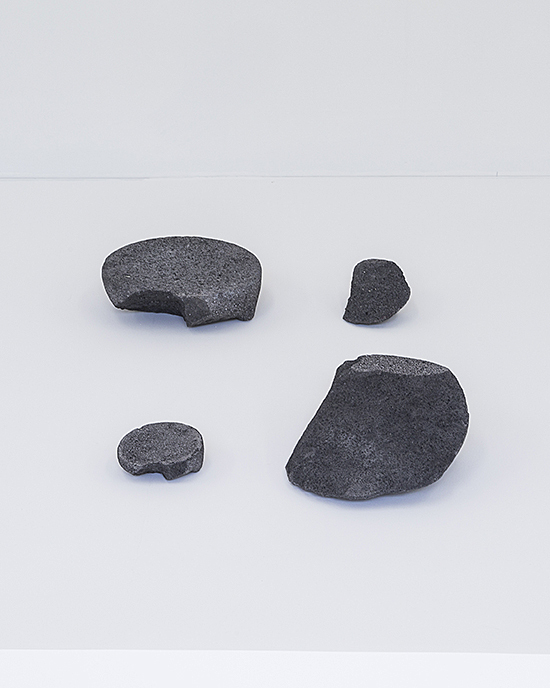 In 2014, Jorge Satorre produced two art exhibitions that were inspired by his frequentation of the Museo Comunitario; one was at his dealer in Mexico City and the other was also with his Mexican gallery but this time at the international art fair in Basel, Switzerland. Using drawing and sculpture, Satorre drew attention to the different world visions and knowledges embedded and adopted in the two classification systems: the dry facts of the centralised INAH system and the circumstantial evidence from the Museum’s volunteers. 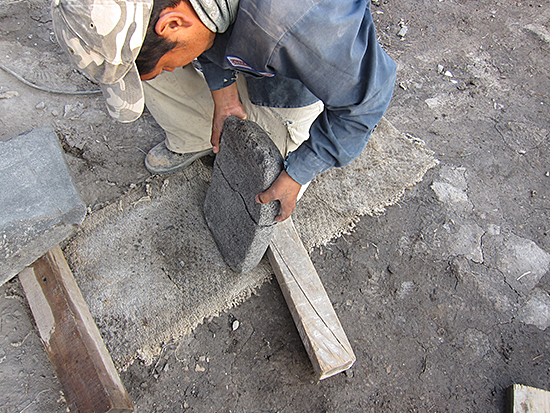 Furthermore Satorre decided, after consultation with Don Genaro Amaro and the others, of proceeding to pierce holes in objects reproduced with the help of a stonemason. 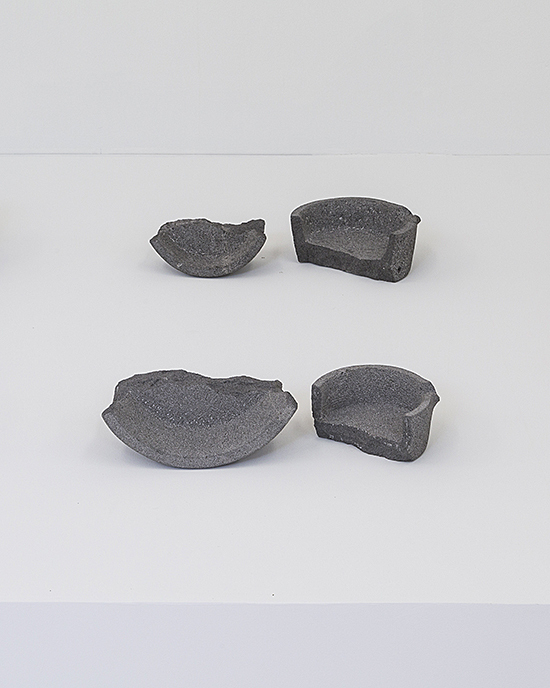 “Each replica was broken into two pieces and those were then reproduced again but inverting their masses, so that the smaller piece is turned into the larger, and vice versa” (excerpt from the text available at the gallery’s booth at Art Basel). 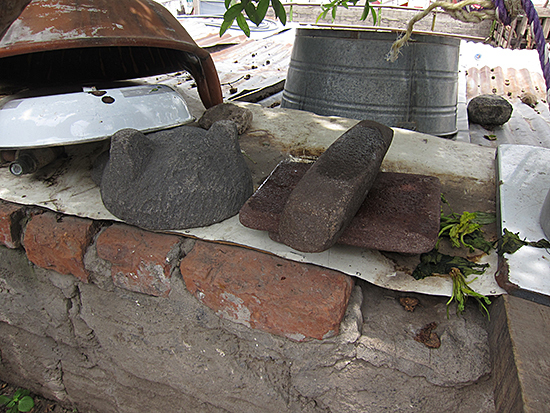 Satorre explains the gesture of “Killing Pots” as follows: “This sculptural work, as well as the title of the project, draws on a custom of various Pre-Hispanic cultures who would make a hole or break domestic utensils before burying them with the dead (..)”. We are faced with a cycle that goes from an archeological object, to its domesticated use- once unearthed-, to a second consecration occurring when a hole is placed and the function is suppressed, then the object is dislocated from its context and can be observed when it rests statically on a viewing platform. On the background of this essay there are upheavals unfolding: in Mexico people are protesting on the streets for the disappearance of 43 students but also for the widespread corruption of the government, in New York and elsewhere citizens are marching against police brutality and to send a message after officers were not indicted for the killing of three black males in different parts of the country. In our post-ideological post-colonial world, talking of fixed meanings and the concept of truth seem enterprises worth of the search for the Holy Grail in an Indiana Jones-movie. On the one hand, there is the artist’s work and on the other, the human bond of solidarity and trust that Lozano and Satorre have established with the people of the Museum in Xico. Lozano and Satorre recognise the Museum’s autonomy and ability to self-organise but at the same time they feel close to their struggle and involved in the Museum’ survival and future. From an artistic perspective, Satorre is adamant that the aesthetic choices of the art presentation are only his, although he has discussed his ideas with the volunteers and Lozano. What constitutes the realm of an artist’ responsibility? How to follow the financial implications of these interactions? How to avoid a paternalistic standpoint? How can one offer a ripe context for a spectator that is willing to engage in an interpretation beyond the representation? The process leading an artist to make a work of art is a both a fascinating journey and something that goes amiss in the representation of an exhibition; being over explanatory or didactic is something that artists like Satorre purposefully steer away from. I wonder whether a group exhibition is a format that allows to explore more in depth the different declinations of objects, their formations, histories and meanings, by presenting various case studies and comparing a series of experiences which contribute to recreating their own specificity. Among the participants in Lozano’s show there is Satorre’s name but also the Museo Comunitario del Valle de Xico. Maybe what is important to stress is that the kind of art we are discussing is not made in isolation, it does not exist in a void, and yes on the one hand there is an artists’ singularity and his choice for an artistic methodology, on the other the collective force of social relationships. The Museo Comunitario, for the founders, the volunteers as well as for Satorre and Lozano, is the opposite of a sterile place for contemplation, is instead a lively nexus for social aggregation, education and the corroboration of a community spirit. The pull is to have a one fits all solution, a monolith, but what we are left with is only shards, fragments of stones standing for many histories, traces of many paths. The paradox and the fascination of this narrative to me lies in its many contradictions, knots that are not fully untangled. Those objects navigate space and time and the globalised art world, they arrive to different observers that see them through the lens of shifting social, cultural and economical constructs.